Kabuki superstar Ebizo Ichikawa XI returns to Sadler’s Wells this June. He brings with him both long tradition, as a direct descendent of the 17th century Ichikawa dynasty, and a thoroughly modern glamour. The programme is taken from the epic play Yoshitsune Sembon Zakura (Yoshitsune and the Thousand Cherry Trees), in which Ebizo – together with over 40 distinguished actors and musicians – gives a virtuoso display of Kabuki stagecraft. 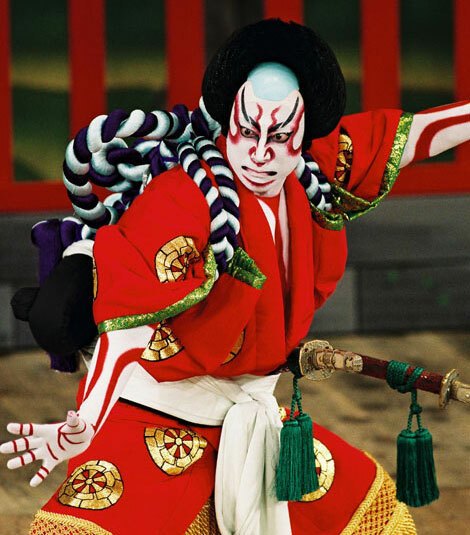 He takes on the dual role of Yoshitsune’s loyal retainer and the enigmatic fox spirit; performing the dazzling sequence of stage tricks that has made this one of the most popular works in all of Kabuki. JapanCentre.com is also offering the chance for two lucky customers to win a pair of tickets to the performance on Monday 7 June at 7.30pm. All you have to do is enter “Kabuki competition” in the comments section when ordering online or below and you will be automatically placed into our Prize Draw! Good Luck! Competition now closed. Congratulations to YOGO and Neha Zubair Dar – please check your inboxes. Thanks to everyone who entered! Loving the blog; recipes were what drew me to the site, but all the extra stuff is awesome too. I never knew this was happening in London, I’ve always wanted to go see kabuki! Awesome! Kabuki competition – Oh wow!! I love kabuki soooo much saw so many in japan and would love to see it again! Thank you so much for giving us this opportunity! Am very excited – pick me, pick me! oops, I forgot to enter the words “kabuki competition” in my message! I wish I could win. Fingers cross. Missed out via the Japan Society, so I will keep my fingers and toes crossed for this.